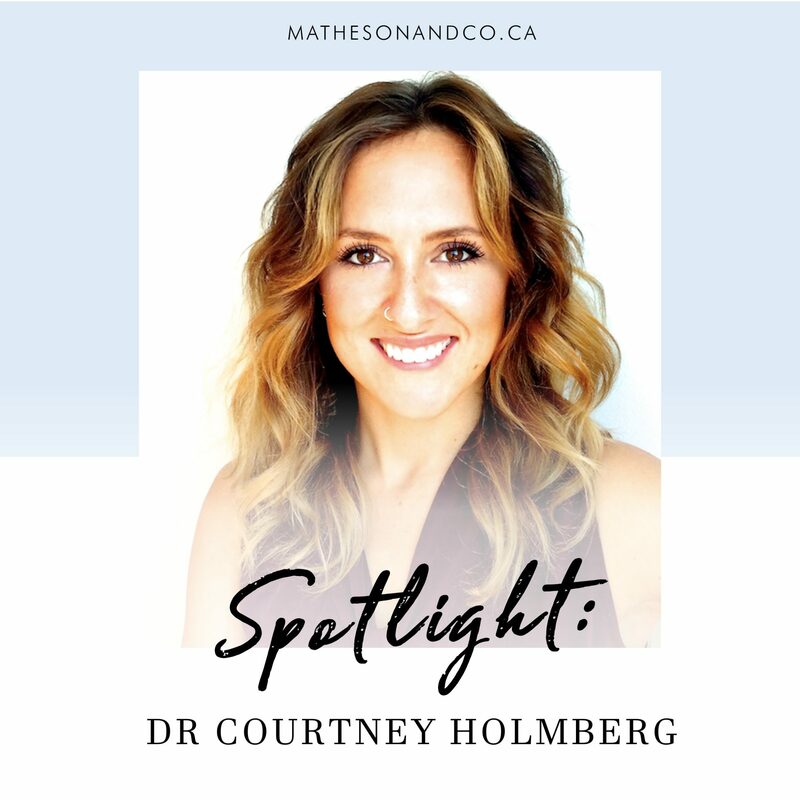 Practitioner Spotlight: Dr. Courtney Holmberg, ND | Matheson & Co.
I’ve been wanting to start this new series for a while and I am so excited to finally bring it to you! This spotlight series will be highlighting awesome practitioners each month who are out there making a difference AND killing it in their practices. I really want you to see first hand the journey other practitioners have taken so you can learn, and be inspired about the possibilities for your own business journey. WELCOME COURTNEY! TO QUICKLY RECAP: HOW LONG HAVE YOU BEEN PRACTICING AND WHAT DO YOU DO? This November will mark my 5th year in a practice (wow, time flies) as a Naturopathic Doctor. CAN YOU TELL US A LITTLE ABOUT WHERE YOU PRACTICE AND YOUR CLINIC SET-UP? I practice at a multi-disciplinary clinic called Platinum Health & Wellness on Queen St West in Toronto. I’m an associate at the clinic, and this is my only practice location. When I started, I worked at a second location because I thought more exposure meant faster practice growth. In reality, when I chose to focus my energy on one location that felt like the best fit for me and my patients I was really able to build my dream practice. The whole team at Platinum is wonderful to work with, and we try to internally refer when needed to help maximize patient care in an integrative way. I have a great working relationship with the clinic owner, and have full autonomy to run my practice as I see fit, which has been and will be the reason I’ll be here for a long time. HOW MANY HOURS EACH WEEK ARE YOU GENERALLY SEEING PATIENTS? I’m working one on one with patients on average 36 hours/week. An entire business day is also currently spent on practice management. WHERE DO MOST OF YOUR NEW PATIENTS COME FROM? About a 1/3rd of my patients come from referrals, and a small portion from walk by traffic. Since my patient demographic tends be young/middle age adults, most of my new patients are finding me online via web search or through social media. WHAT WAS THE BIGGEST SHOCK OR SURPRISE TO PRACTICING IN THE REAL WORLD VS. WHAT YOU LEARNED IN SCHOOL? Going through school, you’re so focused on the clinical aspects of practice that its easy to forget about the business management side of things. I spend a lot of time outside 1-on-1 work with patients being an entrepreneur and essentially running a business. I’ve made wonderful working relationships with some great experts in accounting and marketing that have made my life much easier. The one thing I see as a constant struggle in my profession is not people’s ability to be great practitioners, but more so an inability to grow and manage a successful business. It’s something that’s not taught enough in school, and can hinder your career if you have all of this incredible knowledge to share, but an inability to get the knowledge to the right people. WHAT HAS CHANGED FOR YOU FROM WHEN YOU FIRST STARTED AND NOW? When I first started practicing, as with any new grad, I had a very small patient load and a lot of spare time. That’s drastically changed now, and I’ve had to break a lot of bad habits I developed in the early stages when I had time and put some better boundaries and strategies in place to better manage my time. I’ve also re-arranged my hours. At the start, I was working a lot of evenings and weekends, which I’ve since adjusted to prevent me from burning out and it’s been working out really well. Lastly, I’ve focused on becoming an expert in specific pathologies and medical complaints, versus trying to do it all. This has only allowed me to better treat the patients in front of me, and has also allowed me to spend less time in front of the computer researching since these concerns are something I see every day and feel very confident in managing. I refer out for concerns I don’t specialize in. WHAT DID/DO YOU DO TO PROMOTE/MARKET YOURSELF AND YOUR SERVICES? I first asked myself what my ideal patient looked like, and where they hung out. I focused my efforts on finding and speaking to the patient population that best met my clinical expertise, which is digestive disorders and endocrinology. I then developed marketing strategies targeted at where I could best reach out to those patients. I did education seminars in nearby workplaces to my office that employed my patient demographic. I left flyers and information pamphlets in businesses (like yoga studies and health conscious restaurants) that aligned with my message. I focused my time on becoming an expert on a few conditions vs trying to be jack of all trades. I also invested into SEO for my website and built up my social media content because I knew a large portion of my targeted patient demographic is online. I think it’s easy for practitioners to stay within their comfort zone and market themselves only online, but you have to ask yourself who is going to see it, and how. How will people find you, and which resource are they using to do so? How do you stand out amongst all the noise of information online surrounding health? Are you in a small community where everyone reads the local newspaper? If you’re in a big city with 100+ other practitioners, how are you going to rank first page online? These are all questions you have to answer before starting your marketing strategies. WHAT HAVE YOU FOUND TO BE THE BEST WAY TO GET YOURSELF BOOKED (AND STAY BOOKED)? Besides strategic marketing, I’ve found that the most effective way to keep my schedule full was to specialize. A colleague of mine once said, “you wouldn’t go to a Chinese restaurant for Italian”, and she was spot on. People are looking for help from someone who does something really well. Practitioners are often afraid that by specializing, they’ll narrow or limit their targeted audience, but I’ve found the opposite to be true. People want someone they feel confident in with extensive knowledge in their specific medical concern(s). By developing unique expertise, people think of you first for those particular medical concerns, and/or will refer fellow friends or colleagues to you because of it. Most of my new patients now come from referrals, or because they’ve found me online – not because they were looking for a Naturopath, but because they were looking for a Naturopath who focuses on x,y,z. WHAT SYSTEMS, SOFTWARES OR PROCESSES HAVE BEEN INVALUABLE TO RUNNING YOUR DAY TO DAY? Online booking and electronic medical charting have been critical to me running an efficient practice. When I joined my current clinic, they were using paper charts, so I opted to pay for and use my own EMR system. Now, with over 1500 + patients, it allows my patients to fill their forms out online ahead of time (limiting admin time with paperwork). It allows me to send my prescriptions and handouts digitally (reducing my paper trail on the environment), and lets my patients book and manage their appointments online. I would advise myself to focus in on what I’m good at, and out-source the rest. As a new grad I had a lot of time and a lot of debt! I tried to do everything myself, maybe not always the most efficiently, and wasted a lot of time and effort trying to learn things I knew little about in an attempt to save money. I eventually learned that this wasn’t the best approach. I always tell my patients not to try to treat themselves with the information they find online and to ask the experts, and I realized I was doing this myself, but with my business. I hired on the appropriate SEO companies and support staff and connected with the right people in my industry who were thriving. I then had time to focus in on that I was good at, which was medicine, and as a result my practice also thrived. AND FINALLY, WHAT DO YOU DO OUTSIDE OF WORK TO MAKE SURE NOT SURE ONLY YOUR PRACTICE BUT YOUR LIFE THRIVES? I spend as much of my free time as I can outdoors. I grew up in northern Ontario and have always had a love for nature. It grounds me and helps me refocus. I have a slight obsession with my dog Lennon and we love to go long hikes or spend time down by the water. I enjoy travelling in my down time, and am always looking for unique places to saturate myself in new cultures and experiences. Yoga is and always will be a constant in my life. But in truth, there’s nothing I love more than a good jam session around the campfire on summer nights with the family. Ahh! I honestly love it. I hope her wonderful wisdom will serve to inspire and motivate you to put a little thought, strategy and effort in to the business side of your practice. Because Dr. Holmberg is a perfect example of the incredible results you can see when you. You can find out more about her and her practice at www.courtneyholmbergnd.ca. I could not agree more Margo. Glad you liked the interview Courtney is such an inspiration to other practitioners out there. We are a multidisciplinary wellness centre offering complementary healthcare in downtown Toronto.The Zentai Wellness team is comprised of qualified and experienced health practitioners who will provide you with exceptional care.At Zentai Wellness Centre, our goal is for you to feel safe, comfortable and trusted while we journey together on the path to good health.we provide a unique clinic with a team of experts to treat your wellness needs.we offer a wide variety of alternative medicine treatments – such as acupuncture, nutrition & lifestyle counseling, massage, psychotherapy, hypnotherapy, herbal medicines, and detoxification services.